Buckeye Valley’s Jared Gedde (31) shields the ball from a Horizon Science defender during the first half of Tuesday’s Division II district tournament opener in Delaware. Things were looking good for the Buckeye Valley boys soccer team. Jared Gedde found the back of the net off an assist from Eli Aquino in the 45th minute and, one minute later, Ben Daily hammered home his own rebound to give the 15th-seeded Barons a 3-1 lead early in the second half. 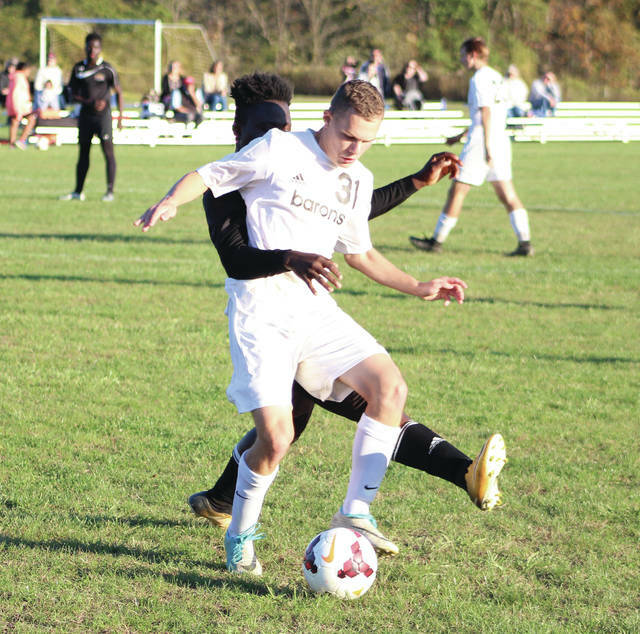 Sixteenth-seeded Horizon Science Academy took charge from there, though, scoring three unanswered goals to escape with a 4-3 win in the first round of the Division II district tournament Tuesday in Delaware. Raymond Cobbold got Horizon Science back into things in the 53rd minute, converting a penalty kick to make it a 3-2 game. Akwasi Yeboah evened things up in the 63rd minute and Brian Agustin Cano beat BV keeper Cole Davis with what proved to be the game-winning goal in the 70th minute. The first half was just as tight. The Barons’ Felipe Scharff scored on a laser from 30 yards out to open the scoring summary just eight minutes into the action and Horizon Science scored off a throw-in as the teams entered the break knotted at one. Horizon Science finished with a 10-5 edge in shots. Davis finished with six saves in the BV goal while Leslie Cobbold had two for the visitors. Buckeye Valley finishes the season 9-7-1. Olentangy picked up its 10th win of the season — a new program record — in thrilling fashion, topping New Albany 2-1 in overtime in the first round of the district tournament Tuesday in Lewis Center. Joey VanGorder and Elise Harder finished with the goals, with Emma Brown credited with assists on both tallies. The win sets up a showdown with two-time defending state champ Thomas Worthington next Tuesday night. Also: Upper Arlington 1, Olentangy Orange 0, 2OT. https://www.delgazette.com/wp-content/uploads/sites/40/2017/10/web1_barons31.jpgBuckeye Valley’s Jared Gedde (31) shields the ball from a Horizon Science defender during the first half of Tuesday’s Division II district tournament opener in Delaware.